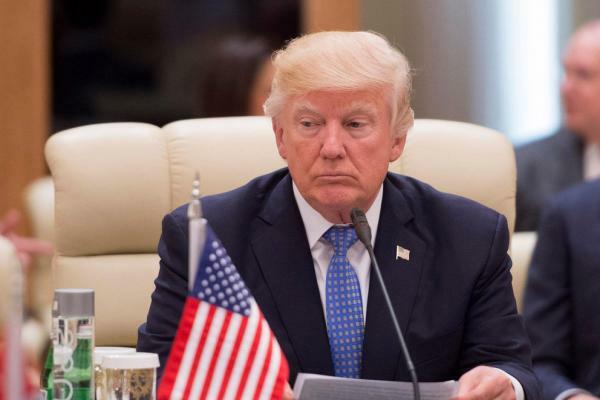 May 21 (UPI) — U.S. President Donald Trump, departing from his “radical Islamic terrorism” rhetoric, on Sunday asked Muslims to share in a “battle between good and evil” in the conflict against “Islamist extremism,” adding it is not a war against Muslims. Trump called on Muslim countries in the Middle East to bear more of the share in fighting terrorist groups including the Islamic State. “We can only overcome this evil if the forces of good are united and strong — and if everyone in this room does their fair share and fulfills their part of the burden,” Trump said at The King Abdulaziz Conference Center. The world cannot solely rely on Americans, Trump said. But the United States won’t force its wishes on Muslims nations. Trump has been concerned about conditions in Iraq and Syria. Last month, he ordered the firing of 59 Tomahawk cruise missiles into a west Syrian airfield from where it’s believed President Bashar al-Assad‘s regime launched a deadly chemical attack this week that killed and injured hundreds of men, women and children. During his campaign, Trump had fiery rhetoric. He criticized President Barack Obama for not using the phrase “radical Islamic terrorism.” He also said “Islam hates us,” called for a ban on Muslims entering the United States, floated possibly creating a database of Muslims in the United States and called for surveillance of U.S. mosques. Lt. Gen. H.R. McMaster, the president’s national security adviser, has pushed Trump to stop using the phrase. On Sunday, Trump was reaching out to the the world’s 1.6 billion Muslims worldwide and at a place that is home to Islam’s two holiest sites. “If we can change the conversation in the Islamic world from enmity toward the U.S. to partnership with the U.S., and if we can change the conversation in the U.S. and in the west from enmity toward the Islamic world to one of partnership, we will have truly changed our world and truly drowned the voices of extremism, and drain the swamps from which extremism and terrorism emanates,” Saudi Foreign Minister Adel Al-Jubeir said Saturday. But Trump’s administration is continuing to defend the executive order signed to bar visitors from six Muslim-majority countries. It was blocked in federal court and an appeals court is weighing whether it’s attempt to fulfill his campaign promise to ban Muslims from the U.S.